Becoming a great leader takes work. This collection from Harvard Business Review offers the ideas and strategies to help get you there. 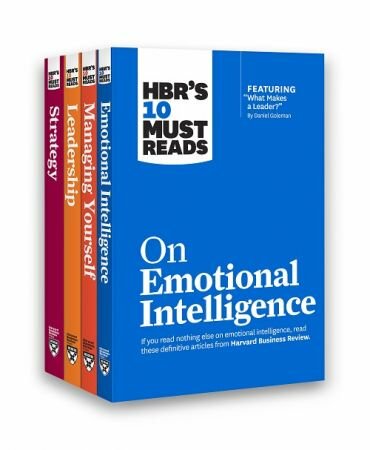 The HBRâ€™s 10 Must Reads Leadership Collection (4 Books) includes the popular books HBRâ€™s 10 Must Reads on Leadership, HBRâ€™s 10 Must Reads on Managing Yourself, HBRâ€™s 10 Must Reads on Strategy, and HBRâ€™s 10 Must Reads on Emotional Intelligence. This unique compilation offers insights from world-class experts on the topics most important to your success as a leaderâ€”how to inspire others and improve team performance, how to galvanize your organizationâ€™s strategy development and execution, and the best ways to chart your own path to professional success. The collection includes forty articles selected by HBRâ€™s editors from renowned thought leaders including Michael Porter, Peter Drucker, John Kotter, Daniel Goleman, W. Chan Kim, and RenÃ©e Mauborgne, as well as the bonus award-winning article â€œHow Will You Measure Your Life?â€ by Clayton Christensen. Itâ€™s time to transform yourself from a good manager into a great leader. The HBRâ€™s 10 Must Reads Leadership Collection will help you do just thatâ€”and will become an invaluable addition to your management toolkit. HBRâ€™s 10 Must Reads series is the definitive collection of ideas and best practices for aspiring and experienced leaders alike. These books offer essential reading selected from the pages of Harvard Business Review on topics critical to the success of every manager. Each book is packed with advice and inspiration from leading experts such as Clayton Christensen, Peter Drucker, Rosabeth Moss Kanter, John Kotter, Michael Porter, Daniel Goleman, Theodore Levitt, and Rita Gunther McGrath.